i’ve been mouthing off on this page a bit lately – time to get back to that which i actually do know something about. been working on that commission piece and ran into some problems with the most recent block – fabric problems, that is. yes, there were some ‘pattern’ problems with the other two ^_^ – nothing tooo serious, did cause me to make some changes and replace a few patterns. sure hope anyone who has a copy of the original either can make the corrections or will contact me and i’ll send one of the newer ones!! it’s mostly a matter of wrong numbering and will be pretty obvious when you are sewing on the pieces. 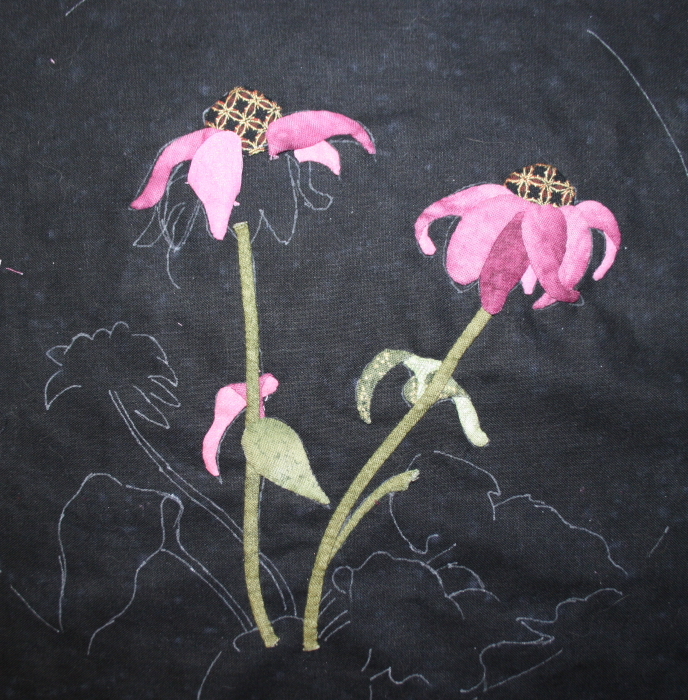 now i’m working on the cone flower and the first fabric i used, and what is currently in the kits – i really liked how i was able to fussy cut for shading. however, kept having this nagging thought about the (here’s where i don’t really know the correct terminology, so bear with me) ‘tone’ of the pink. seemed a lot ‘grey’ to me. sure enough, when i placed the block near the other two – ick. they made it look sick! and i do not mean that within the new slang definition!! i mean, like puke. 😦 and in the process of pondering what to do, and how much i’d have to remove, etc – i also noticed i had made a really glaring mistake! how could i have done that?? and then, how could i have not noticed it as i was continuing on??? good grief! a trip to myra’s got me a replacement fabric. not a big difference, certainly not as grey. also not as good for fussy cutting for subtle shading. dang. i had taken a picture of the first one before i took all the pieces off – and just took a picture of how it looks now. unfortunately the difference is even less obvious in these pictures. 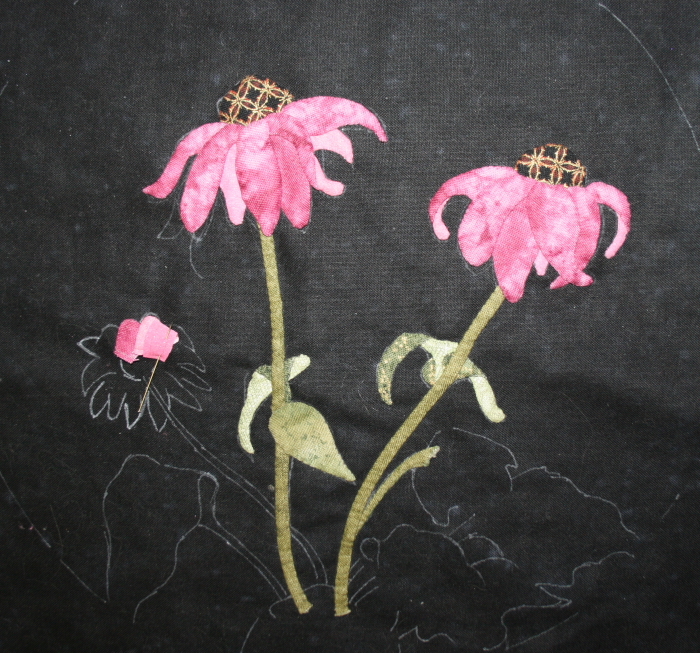 i did save the one group of petals that came off together – when i place them next to the new ones – very obvious!! it’s also interesting to notice what the camera and computer did with the colors – specifically the green. i did not change the green. it does not look the same in the two pictures. i think i took the pictures in the same place in this room? ?